After years of excuses, I finally decided to go “all in” with Rapha this winter. Sure I have other kit, but Rapha’s blend of modern, yet old school styling and technical innovation became too tantalizing to ignore. So after weeks of unseasonably mild temperatures and a hectic work schedule, a Thanksgiving cold snap finally gave me an opportunity to try these two workhorses of Rapha’s winter line—and I was mighty impressed. The Winter Jersey feels lighter than it should for something so warm. Lined in all the right places to block the wind—but unlined and vented in others to allow moisture to evaporate—I wore the “jersey” (it’s really more of jersey-jacket hybrid) with only a base-layer underneath in temperatures that dipped into the upper 30’s. In other words, it practically begs you not to overdress. Tapered sleeves and extra-long cuffs protect your wrists while a high, fleece-lined collar keeps your neck warm and toasty. As for the Thermoroubaix Classic Winter Tights, I was first drawn to them by their lack of a chamois. This is entirely a personal preference, but chamois-less tights allow you to use your own bibs, meaning less tight-washing in between rides (it’s not gross, it’s efficient). Plus, wearing bib shorts underneath tights also gives you the option of adding knee warmers to the mix, offering an extra layer of protection on really cold days. And like other Rapha products, the Classic Winter Tights include seemingly minor but much appreciated details such as a reflective leg stripe, a zipper down the front (for easy access during nature breaks), and a small, hidden pocket to stow your keys and some cash. Pros: Terrific style and features make these some of the best winter items on the market today. The jersey is warm and light, while the tights feel great over a pair of bibs. The fit of the jersey is tailored but not restrictive. And whoever designed the tights paid special attention to seam placement. 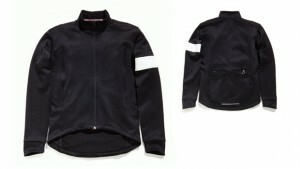 This entry was posted in Featured, Musette and tagged holiday gift guide, rapha, winter jersey, winter tights. Bookmark the permalink.